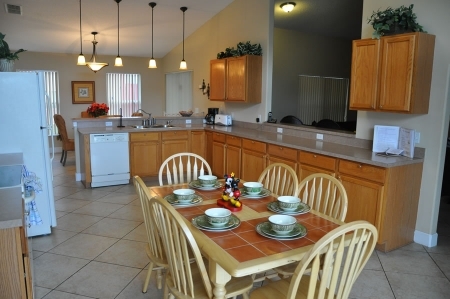 The large kitchen is fully equipped with all major appliances, and everything you would need to eat in. There is a nice bar area off of the kitchen to the living room area with stools to sit and relax...The extra large living room has a 50 inch LCD TV with DVD player, and HD receiver with PVR. Wireless internet is provided. Along with free local and long distance to the U.S. and Canada. Large patio doors lead you from the living room out onto the patio out back. Each bedroom is equipped with a TV, cable and a patio door opening to the pool area. The master suite has king size poster bed with large granite top dresser. Large walk in closet in the master suite. The en suite has a shower and a tub with a door opening to the pool. Master suite also has patio doors opening to the back deck as well. The second bedroom has a queen size bed with a large walk in closet. The third room is our Mickey room with 2 twin beds. 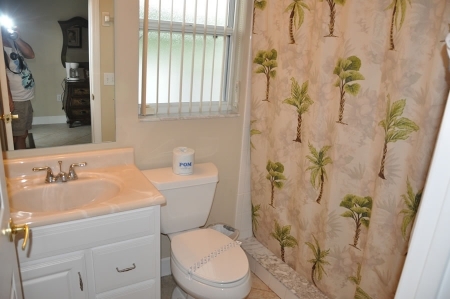 The bathroom is shared between these two bedrooms. There is also a playpen, crib and a high chair for your use. The fourth bedroom we call it our in-law suite...self contained with it's own bathroom with a shower. Out the back of our home is a 32 x 10 foot patio with deck chairs for your use including loungers for sun tanning. Off of the dining room is a screened in patio with deck chairs and a table. Very nice for a meal or just relaxing...Gas BBQ is located outside of the screened in patio. Our games room is equipped with a pool table, air hockey, foosball, and a stereo. Shopping is close by, Walmart, Publix, Walgreens. and quite a few nice restaurants are close by. Golf courses will be found close by also. Driving is quite easy in Florida, so everything is quite accessible by car.